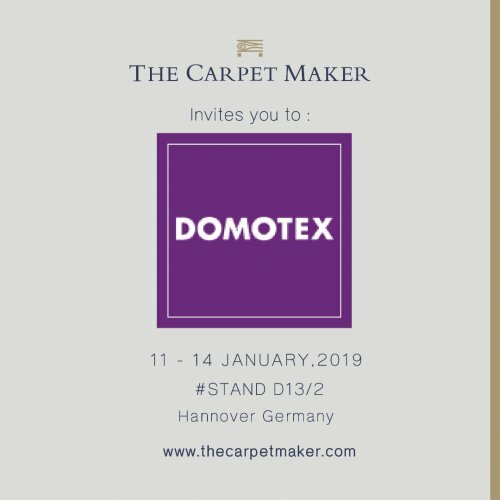 To properly start the new year 2019, The Carpet Maker decided to take part to one of the biggest flooring fair in Europe, DOMOTEX. At this occasion The Carpet Maker will present a dozen of its area rugs and wall-to-wall carpets showcase which are all manufactured either thank to the hand weaving technique or the hand tufting technique. They are being represented with new connecting creative designs and challenging colors techniques which have been developed to surprise you !! Our stand will be held on the location D13/2 in the Hall 9. There will be members of our sales team to answer every of your questions. We are waiting for all of you with impatience and we wish you a Merry Christmas and a Happy New Year until that.